For our first anniversary, we took a trip to Melbourne to have others cook for us for a change! After a delayed and stressful Tiger flight, we arrived an hour and a half late and had missed our Friday evening reservation, so had to go searching for a late night eatery. Not knowing Melbourne's late night scene well, we headed across town as far as we could go to the recommended Mexican restaurant, not sure if we could handle hearty burittos, and stodgy black beans. The food we received in Mamasita was a far cry from that! This late night taqueria is authentic Mexican, not the tacky Tex Mex we're more familiar with in Australia, and the plates of soft tacos were perfect for our late night snack. We had a variety to taste: braised veal tongue and ox cheek, where the meat was so tender and tasty, chorizo with a spicy kick and juicy marinated prawns - perfectly cooked and delicious flavour. The service was outstanding (particulary contrasted to the Tiger Airline customer experience we'd been subjected to earlier in the evening) and although we didn't brave the long tequilla list, the sangria and Mexican beer lifted our spirits and kicked off a great weekend. We had been hoping to make it to Josie Bones, Chris and Julia from MasterChef Season 1's beer bar and nose to tail eatery, but we have to pay that a visit on our next trip, since we managed to juggle our Movida Aqui reservation and secured a table on Saturday night despite being a no show on Friday. 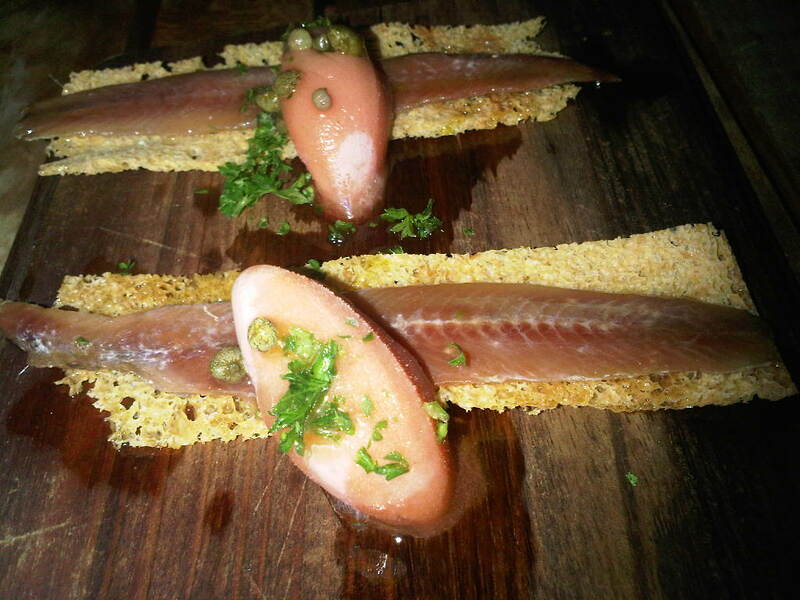 Movida Aqui is the 3rd member of Frank Zamora's Melbourne CBD tapas restaurant family. We followed the waiter's recommendation and stuck to the tapas menu this time. We need to go with friends next time to be able to order the large serves of amazing looking paella. The tapas, raciones and specials were more than enough to tickle our tastebuds. We started with the Anchoa, a dish that Frank Zamora demonstrated during his slot at MasterChef Live, substituting strawberry sorbet for the presentation of the dish! We were excited to taste the real thing, and it was an interesting combination of cold, salty and crunchy. Delicious! The jamon was a must have taking me back to my days in Spain, and the Bomba, the chorizo filled potato ball, which Marion prepared on MasterChef to beat Zamora for the immunity pin, was tasty. One of the highlights for me was the Tortilla de Cangrejo - fresh mud crab in a tortilla (Spanish omelette). It was light, fluffy and flavoursome. The Vieira, grilled scallops were delicious. 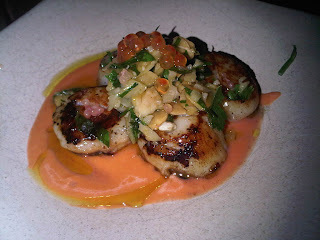 We found it served with a few too many almonds, but a perfectly prepared scallop always makes for a tasty dish. I can't get passed the way the salmon roe literally pops in my mouth, so I loved it! Perhaps the dark horse of the evenings selection was the Cordoniz con Kikos - Grilled Jumbo Quail filled with duck liver parfait, served with sweet corn puree and toasted corn. The combination of the crunchy toasted corn, the smooth duck liver parfait and the tender quail meat was a real taste sensation and a balanced, delicious end to a fabulous dinner. So tasty, we wanted to savour the lingering flavours and couldn't fit another thing in, that we passed on dessert!